This Greater Orange, Santa Ana & Anaheim Area sports bar with liquor and a fantastic patio is a baseball and hockey enthusiastâ€™s dream, and many fansâ€™ favorite destination! The bar, which is located near the epicenter of all of the sports and entertainment action, provides patrons fantastic freeway access to all of Orange County, as well as to Los Angeles, Riverside and San Diego Counties (and yes, patrons will travel from such distances to frequent this unique venue). The recently renovated venue offers two bars, an overhauled kitchen, plenty of seating, and enough flat screens to simultaneously capture all of the action. The venue also offers video games, music and a new menu. This place is ideal for a working owner-operator who doesn't mind gaining 100â€™s of new friends, most of whom are regulars, while managing a place that fans consider their home away from home. As the seller does not work at the bar, transition should present a new owner few challenges. Location and Facilities: This 2,450 square foot facility (plus 500 sq. ft. patio) leases for $6,000 per month on a new 5 year lease with one five year option. 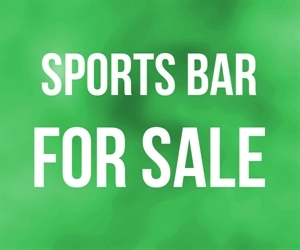 The sale includes all of the assets of the business (except for games) including a full kitchen, two bars and several serving stations with plenty of beer taps, an ice machine and approximately 10 large sports filled flat screens. The facility is approved for at least 105 patrons inside but the space is large enough to comfortably accommodate many more. Market Information and Position: The current owner is absentee and is not a seasoned bar operator. As such, an aggressive marketer may be able to immediately increase revenues via promotion offerings, themed nights, special events, event sponsorships, etc. Naturally, a full-time working owner may save on various employee salary expenses, while ensuring that customer service remains a top priority for bartenders and wait staff. Given this venue s stellar location there are naturally several would-be competitors. Competition: This bar, however, enjoys an unparalleled competitive advantage on several fronts including its location, its unmatched freeway access, its outdoor patio and onsite parking lot, and perhaps most importantly, its tenant friendly landlord!